Phillip von Hohenheim, also known as Paracelsus, was born in Switzerland on the 11th of November 1493, the son of a German chemist. When he was 16, Paracelsus went to stude medecine at the University of Basel. By 1516, Paracelsus had gained his doctorate from the University of Ferrara. 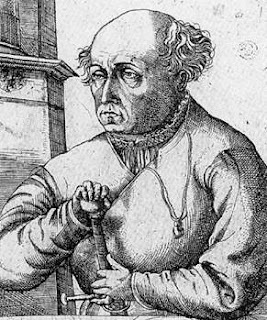 As a physician, Paracelsus pioneered the use of chemicals and minerals as forms of medicine, and often found himself in disagreement with traditional medical books. Paracelsus's arrogance led to him being kicked out of the University of Basel's staff and out of the city of Basel. Paracelsus wandered Europe in search of knowledge. He would take old manuscripts and revise them. In 1536, Paracelsus published Die grosse Wundartznei, which helped Paracelsus to regain some fame. Paracelsus was known for burning traditional medical manuscripts, and many attributed this to his upbringing as a Lutheran. Paracelsus rejected the idea, saying that himself and Luther both have their own ideas and each is simply defending them, though their ideas are quite different. Paracelsus is famous for his idea that the celestial bodies, the different metals, and the different human organs are connected, and along with being a physician, Paracelsus was an alchemist. Along with being a physician and alchemist, Paracelsus was also one of the first to experiment with psychotherapy and is known by many as the father of toxicology. At the age of 47, in the year 1541, Paracelsus died of natural causes and was buried in Salzburg. Paracelsus is on our list for being an outstanding figure of both medicine and alchemy during the same time.